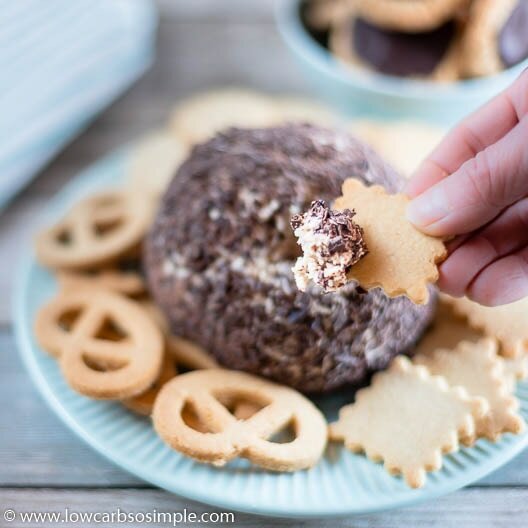 Low-Carb Chocolate Chip Cheese Ball | Low-Carb, So Simple! 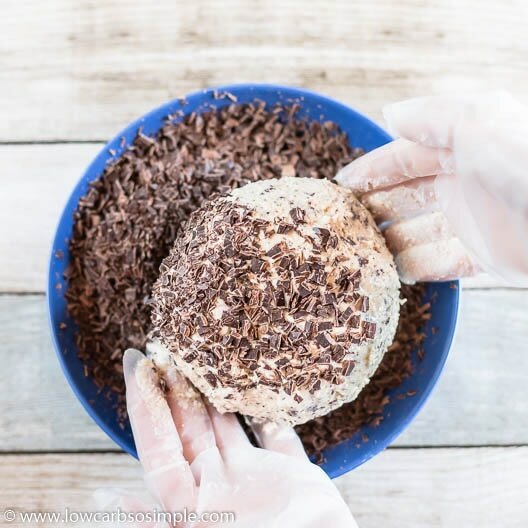 This healthified Chocolate Chip Cheese Ball is easy to make, but it does take some time, so it’s a good idea to start preparing it the previous day. The most important thing to remember is that the butter and cream cheese should be softened ahead of time. This means they should both be at room temperature. If they are too cold, you’ll end up with nasty buttery lumps in your cheese ball. Very unappetizing! So it’s best to take both the butter and cream cheese out of the fridge an hour or two in advance. …until very fluffy, about 10 minutes. Add chocolate chips or grated chocolate. Cover, and place in the fridge overnight, or until firm enough to shape. … and scoop the mixture on it. 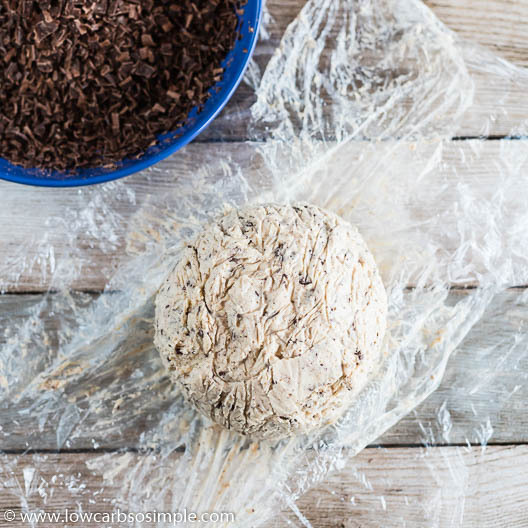 Wrap the plastic wrap around the mixture and shape into a ball. Like this. …and roll the ball in more grated chocolate (or chocolate chips) . For a very long time, I’ve been dreaming of making a healthier version of a Chocolate Chip Cheese Ball. 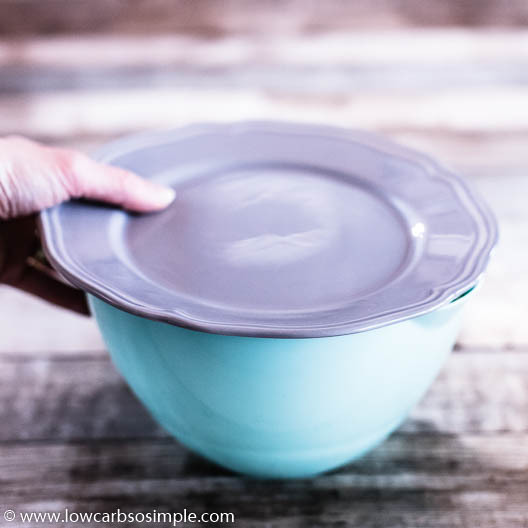 I wanted it to be low-carb and sugar-free, and sweetened only with natural sweeteners. 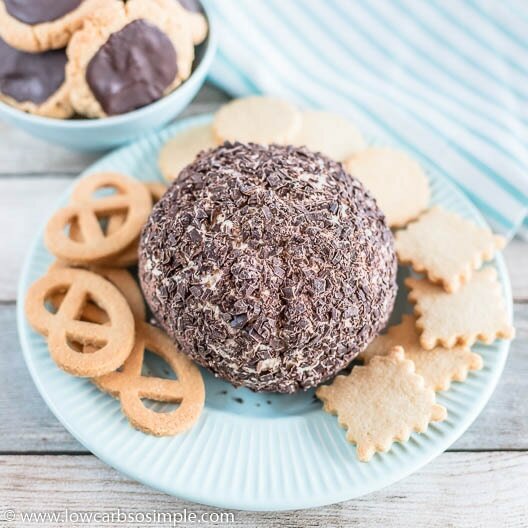 But even though I’d always found the concept of a Chocolate Chip Cheese Ball fascinating, I have to confess that I’d never actually made one (until now!). Since I’ve been on a low-carb diet for a couple of decades, the traditional sugar-laden version is off limits. That means I had to try to create the best possible low-carb version of this retro treat without having a blueprint to follow. 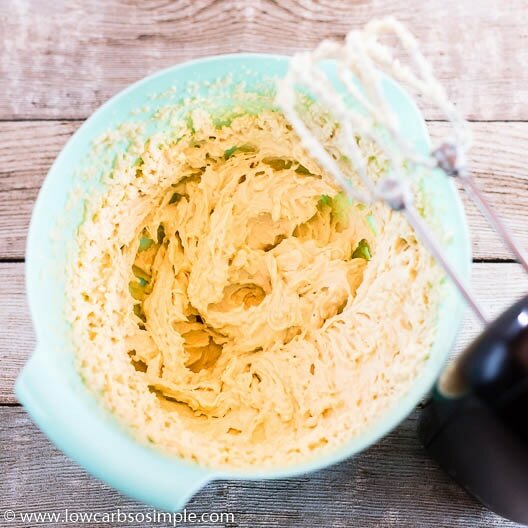 And to be honest, I wanted to post this recipe before New Year’s so that you could have made it for your low-carb and keto New Year’s celebrations. But I was traveling and spent the Christmas season in Germany with my husband’s family, so I wasn’t really able to develop this recipe further or to take the photos and video for it. When I was back home again, I started pondering the ingredients for my cheese ball experiment. I needed cream cheese, naturally, plus some butter. Because desserts often benefit from a pinch of salt, I decided to try making it with salted butter instead of unsalted butter. Let’s see if my Chocolate Chip Cheese Ball turns out too salty! -I thought. That’s the whole point of experimenting, right? 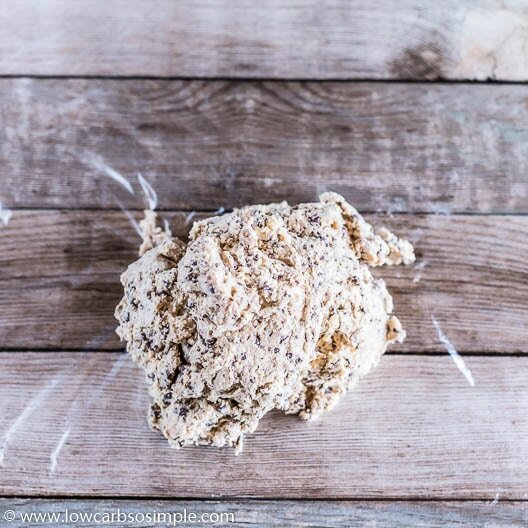 Since the traditional version often contains brown sugar, I wanted to add an erythritol-based brown sugar substitute to my low-carb cheese ball. I chose Sukrin Gold, which has a slight caramel note and mimics real brown sugar very well. I know there’s a brown sugar substitute from Swerve on the market now, but I still haven’t had a chance to try it out. I ordered some from the US, but naturally it takes awhile for it to make its way over to Finland. I’m awaiting it eagerly, because Swerve is such a great brand. For the chocolate, I decided to use 85% chocolate that I had bought on my trip to Germany. I was simply too lazy to use a cheese slicer — my favorite tool for making grated chocolate — so I processed the chocolate into tiny chunks or “chips” in a food processor. I was planning to use part of the chocolate in the mixture and part for rolling the finished cheese ball in. I’d figure out the exact amounts once I started experimenting, I decided. So, for my first experiment, I took 8 oz (230 g) full-fat cream cheese, 6 oz (170 g) salted butter, 1/4 cup (60 ml) Sukrin Gold, 1/4 cup (60 ml) powdered erythritol and 2/3 cup (160 ml) grated dark chocolate. I reserved 1 cup (240 ml) grated dark chocolate for rolling. I beat the cream cheese, butter and the sweeteners until fluffy. I was a bit worried about how the Sukrin Gold would dissolve in the mixture: I didn’t want it to leave a gritty texture. That’s also why I wanted to add it at the beginning of the process — so that it would have some time to dissolve. The vigorous beating wouldn’t hurt, either! I was a bit unsure how much grated chocolate I should add, but decided to try the 2/3 cup (160 ml) that I had planned to use. After I carefully folded the grated chocolate into the mixture, it looked just right. I placed the mixture into the fridge overnight. I had a gut feeling that the mixture would need quite a long time to set before it could shaped it into a ball. Next morning, I took the mixture from the fridge and started shaping it into a ball. To my huge surprise, it was really easy to work with and formed a nice ball without much hassle! I put the ball back into the fridge to ensure that its texture was really stiff and firm. After a couple of hours I removed the ball from the fridge and started rolling it in the 1 cup (240 ml) grated chocolate I had reserved for that purpose. But the amount of chocolate was clearly too much — 1/2 cup (120 ml) would probably have been plenty. Eagerly I grabbed one (fresh!) low-carb cookie and scraped a corner of it against my Chocolate Chip Cheese Ball. The flavor was amazing — just the right level of sweetness — and the balance between cream cheese and butter was perfect. Too much cream cheese would have made it too sour, and too much butter would have made it too bland. And the salted butter was a great choice: it didn’t turn out too salty after all. Everything was just right! Adding the brown sugar substitute Sukrin Gold was the right decision, too. It added a hint of caramel and vanilla that lent depth to the taste—no need for extra flavorings. All in all, a super-yummy creation! 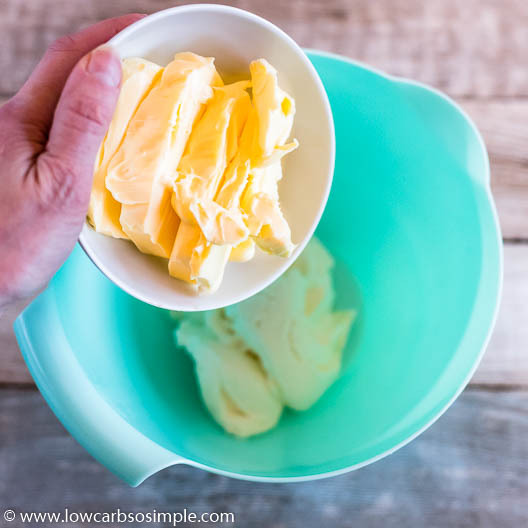 Place the cream cheese, butter and both sweeteners in a bowl. Beat until smooth and fluffy, until the sweeteners are completely incorporated into the mixture, about 10 minutes. Fold in the 2/3 cup (160 ml) grated chocolate. Refrigerate overnight or until firm enough to shape. 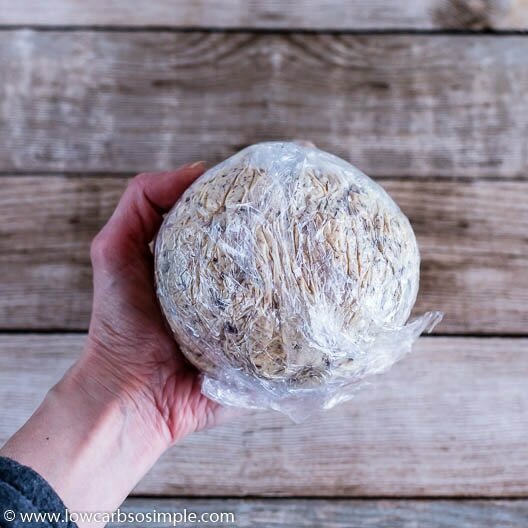 Place the mixture on a piece of plastic wrap and shape into a ball. Refrigerate until ready to serve, at least 1 hour. When ready to serve, remove the ball from the plastic wrap and roll it in the rest (1/2 cup = 120 ml) of the grated chocolate. Serve with gluten-free, low-carb cookies. For a real holiday treat — that is, a pepperminty version — just add 2 drops 100% peppermint oil to the cream cheese and butter. You can experiment with other flavorings, too, like 100% orange essential oil (be sure to use only 2 drops! ), or natural flavor extracts, like orange extract or almond extract.